My step mom made these this summer for me and I loved them so I had to recreate them. You can increase the level of dill intensity according to your taste. Start with a few red potatoes, I used 5 small red potatoes for 2 people. Wash them and remove any bad parts. Then half, quarter and eighth or until they are bite sized/no knife required. Boil for about 8 minutes or until soft when pierced with a fork. Toss with butter, salt, pepper and dill and place on baking sheet. Broil for 5-10 minutes or until crispy on the outside. The boiling and baking combination gives them an outer crunch plus a soft inside. These are a delicious side along with chicken, beef or fish. Wash potatoes. Cut potatoes into eigths/bite sized. Boil in water for 8 minutes or until soft when pierced with a fork. 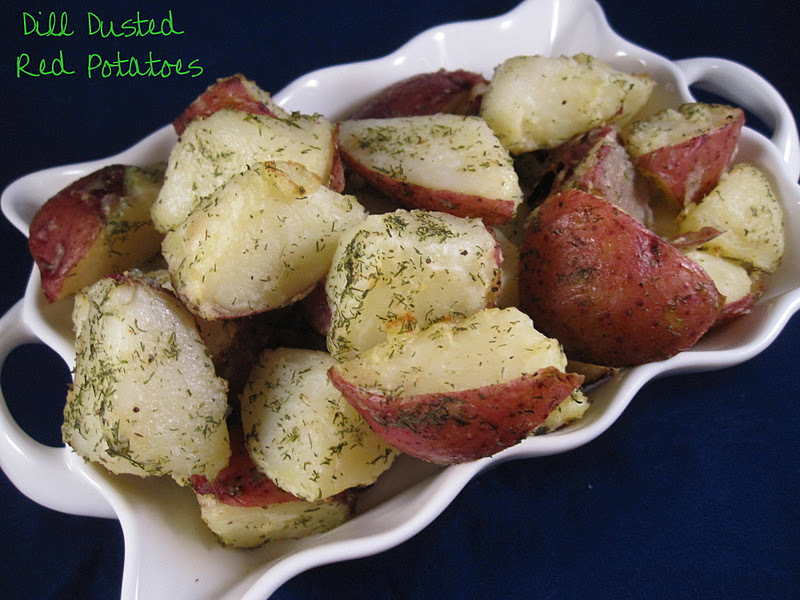 Gently toss potatoes with salt, pepper, butter, and dill. Place on foil lined baking sheet and broil for 5-10 minutes or until potatoes have a nice crisp on the outside. Toss with more butter, salt and pepper to taste, if desired.